Matthew McConaughey was arrested by Austin, Texas police in October 1999 and charged with possession of marijuana and drug paraphernalia after a neighbor called to complain about music blaring from the actor's crib. 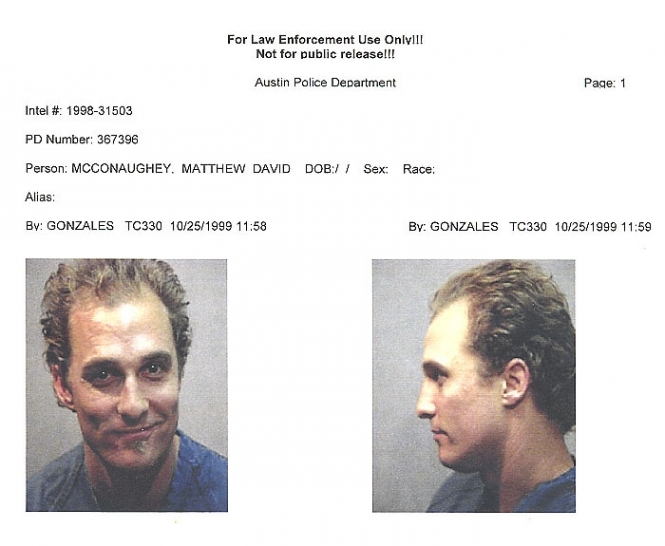 When cops arrived, they found McConaughey dancing around in the buff and playing bongo drums. The drug charges against McConaughey were eventually dropped, though the star did plead guilty to violating Austin's noise ordinance, for which he paid a $50 fine. Submitted by Midknight on Thu, 2011-05-12 05:52. Austin is pretty laid back. You know it has to be COOL if Willie likes it! Submitted by mcfrostbite on Mon, 2011-01-03 11:56. They aren't serious charges. Marijuana possession is a misdemeanor. Check your facts before complaining about how all these celebs get off easy. Submitted by mikedenney on Sat, 2010-11-06 18:05. Submitted by acortenza on Sat, 2010-09-18 01:31.
all serious charges? really? he smoked pot and played the bongos. the serious charge or breaking a noise ordinance stood, that's not good enough for you? maybe bamboo shoots up his fingernails would have been more appropriate. give me a break. Submitted by mamalife on Mon, 2010-09-06 13:46. Submitted by Shelly Shores on Tue, 2010-08-31 04:58. Funny how Matthew was already going bald in 1999 and 11 years later he's got a full head of hair! Not funny that he got all serious charges dropped.